Today: A Monday night magic show. Ladies and gentlemen, boys and girls, vegetarians and meat-eaters alike, step right up and witness the one, the only, the incomparable: the magnificent Monday night magic show. 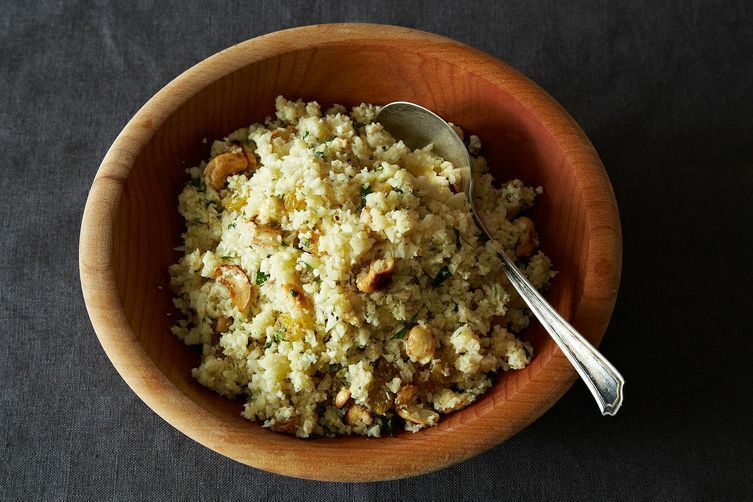 Tonight, you will witness cauliflower transform into couscous right before your eyes. And that's not all: Spices from exotic lands will turn an otherwise bland vegetable into a magical-tasting, you-won't-believe-your-mouth meal. For dessert, sit back and be amazed. Abracabra! Bippity-boppity-boo! Cream, sugar, and lemon juice will transmogrify into a refreshing, creamy custard with just a little time in the refrigerator. Ta-da! Monday night just got a little more magical. You probably have sugar, olive oil, garlic, cumin, salt, and pepper in your kitchen. If not, add those to the list, too. 1. In a small saucepan, boil cream and 2/3 cup of sugar, stirring to dissolve sugar. Continue boiling for 5 minutes. Zest one lemon and then juice them all. 2. Remove the pan from the heat and stir in 5 tablespoons of the lemon juice. Let cool for 15 minutes. 3. While the lemon cream is cooling, place the sultanas in a bowl and pour warm water over them. Let sit for 15 minutes, until plump. 4. Toast the cashews in a skillet over medium-low heat. While they’re getting golden and slightly charred, prepare the cauliflower: Break it into florets, then transfer to a food processor in batches and pulse until finely chopped and the size of couscous. 5. Get your nuts off the stove and drain the water from the sultanas. Return to the posset and distribute it into four ramekins, then stick them in the refrigerator. 6. In a large sauté pan, heat three tablespoons of olive oil over medium heat. Add the cauliflower to the pan and cook for 7 minutes, stirring frequently. Take it off the heat. 7. Mince 2 tablespoons of parsley, crush 1 garlic clove, and chop the cashews. Add that to the cauliflower along with the sultanas, za’atar, 1/2 teaspoon of cumin, 1/4 teaspoon of lemon zest, 4 tablespoons of lemon juice, and 2 tablespoons of olive oil. Season with salt and pepper. 8. Let the couscous sit for 15 minutes while the flavors combine. Meanwhile, set the table and pour yourself a glass of wine. Then, dig in. 9. Clean up the kitchen, make a cup of tea, change into your pajamas, then enjoy the lemon possets you almost forgot about with whipped cream and a cookie. Why don't you get YOUR nuts off the stove. I do love both these recipes. Thanks.